There were many versions made of Lee-Enfield Rifles at factories in England, Canada, Australia, USA, India and Pakistan. No. 4 Mk. I rifles was developed at the beginning of the 1930s at Royal Small Arms Factory. Heavier barrel, aperture rear sight, flat left sidewall and easier production methods. 2,500 rifles were produced for Trials. In 1941-1942, 1,403 No. 4 rifles were converted to sniper equipment No. 4 MK. I (T). Most of those were reportedly Trials rifles, but a very few were reported to be Stevens-Savage made rifles. No. 4 MK. I (T) made at R.S.A.F. Enfield in 1931 serial number A 1986 – Converted to sniper equipment in 1941-1942. The sniper swivel in front of the magazine was added, probably in 1945. 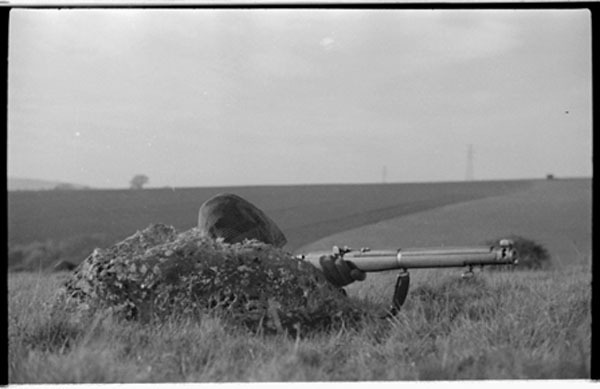 The backsight was ground away underneath so that the rifle bolt could be removed without having to remove the scope and raise the back sight. In service it later had a newer sniper scope fitted and this equipment remained in service until at least 196_. Note the space between the “A” and the rest of the serial number. Some will reportedly be found with an “A” suffix to indicate that there were non-standard parts on that rifle. Over time many, but not all of these were sold off surplus before the No. 4 Mk.I (T) rifles were declared obsolete. No.4 MK. I made at Small Arms Limited, Long Branch, Ontario, Canada in 1941-1942 serial number 1L314– The Canadian factory Small Arms Limited started from scratch in 1940 and produced its first No. 4 Mk. I rifles in mid-1942. In early 1942, they changed to the No. 4 MK. I* model. Over 900,000 No. 4 rifles were made during WWII by S.A.L. at Long Branch. (Note that Long Branch is two words.) but only the first months of production was Mk. I version, and these served through most of the war. As a result, all-original examples are very rare now. This one appears to be all correct and matching. They always say “Buy the gun, not the story”. The story behind this one is that after the war, the Canadian soldier who had been issued this rifle, bought another one surplus and turned that one in instead. Hard to believe as the military tracks all weapons by serial number, but then again, as they were phasing them out, they were about to sell them very cheaply as surplus. This rifle passed directly from that ex-soldier into a long-time collector’s hand in British Columbia, but sadly the name of the ex-soldier was forgotten over the years. Lee-Enfield No. 4 MK. I/3 serial number 90C4966, made by Stevens-Savage in 1944 as a No. 4 MK. I* and then converted to No. 4 MK. 2 hung trigger configuration in 1951 at Fazakerley. US Property marking removed by British. These were only made in North America and featured a simplified bolt removal system, which as it required fewer parts, sped up production time. A few British Made No. 1 Mk.I rifles were erroneously marked as No. 4 Mk.I* but were obviously still No. 4 Mk. I. The C No. 4 Mk. I* was only made by Canadian Arsenals Limited. Physically it is a No. 4 Mk. I*, but the marking system changed slightly, adding the “C” prefix indicating Canadian. The C No. 4 Mk. I* is a scarce rifle as it was only made in the last few months of 1949 and then in 1950. It is reported that spare bodies were made and fated into the mid-1950s and these will appear on rifles where has the serial number and parts moved over to the replacement body. The E.A.L. rifle was made by Essential Agencies Limited in Ontario Canada. This company purchased spare unmarked bodies form those made at Canadian Arsenals Limited, had them modified very much like the 1943-1944 experimental Long Branch/R.E.L. Scout Sniper’s Rifle. They are NOT a sporterized military surplus rifle as they were made new in this configuration. About 1,000 were made for the military, issued to the R.C.A.F for use as survival rifles in larger aircraft and for issue to Canadian Rangers. Thousands more were made for civilian sales, and reportedly some of those “civilian” models may have been issued to Canadian Rangers who normally were issued No. 4 Mk. I*, No. 4 MK. I and No. 4 MK. 2 rifles.